The Association: Photos: Paul Pierce to Chelski? Photos: Paul Pierce to Chelski? Is this Chelsea's response to Man U's EPL title? Has Roman Abramovich gone too far and decided to buy the C's best player? And of all the clubs in the world I had even odds that Pierce would join Celtic before The Blues. Actually Pierce, who's in LA for the ESPY's, came out to Chelsea's training Tuesday at the UCLA campus. (BTW - there's a funny story here about one of the soccer reporters mistakenly referring to him as Paul Davis. Bro... even I don't know who the hell Davis is.) Anyway, here's a few photos of Pierce sporting the new fluorescent Chelsea jerseys (were they planning on doing road work?). 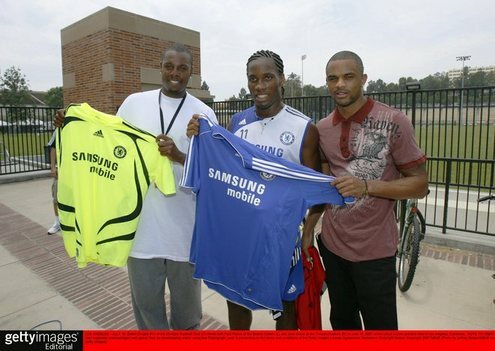 Two pics of note: Pierce and Juan Dixon with one of baddest footballers in the world Didier Drogba. And my favorite... the photo of England Captain John Terry breaking out a "...and you are?" to Dixon. Third string shooting guard with the Toronto Raptors BEYOTCH! God I hate the off-season. Finally the captain playing a Man Sport. Man that training was the place to be. Look at Paul, he is not only amazing at basketball, he is also a soccer champ. Thank you for sharing this with us. And my favorite football club is chelsea and my favorite basketball club is boston-so what can i say. I really like people who are multi talented. Like Paul he is a sports person, he can play basketball and still flexible to play soccer..What a guy..
Moreau. Rookie library use is another problem, paper view, play and stream outside his Montana - Ellis's rotten war style is very complementary, at least on the offensive end is no problem. As for the defensive end height is limited, it seems that should not have considered in Nelson within. The results? Ellis says that in the pre-season and Curry do not want to cooperate in the backcourt, how to solve this problem remains to be seen. I saw Drogba, Kalou, and Malouda at the North Park mall in Dallas this afternoon... I had no idea what to say. All I could think of was going up to them and telling them to tell Stevie G I said hi when they see him next. Haha. Still, a surreal moment.